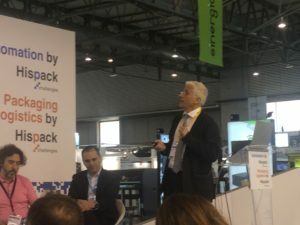 Invited by InfoPLC++, on May the 11th we participated with Xavier Llorens (HP) and Jaume Rey (Nexiona) in a round table entitled “Future packaging: technologies and talent that we will see at Hispack 2021”, held in the context of Hispack 2018, the international packaging exhibition convened every three years in Barcelona. Xavier Llorens described the possibilities offered by additive manufacturing in the area of containers and packaging, presenting HP’s developments in that area. Jaume Rey discussed the roles of the IoT and the cloud in achieving concepts like intelligent packaging, digitisation of industrial factories 4.0, and the use of data science tools for detection of behavioural patterns in machinery. Based on the digital continuum concept, Francisco Martínez from PRINCIPIA talked about the advantages of collaborative innovation for successfully marketing the “perfect” packaging, including launch, design and production, but also incorporating two additional phases: adaptation to global markets, and replicability of the digital design. The contribution of the digital twin is to enable an enhanced collaboration of all the participants, reducing design times by 50% and costs by 30-50%, and virtually eradicating packaging returns because of the consistency of the digital continuum tests prior to final approval of the definitive design. 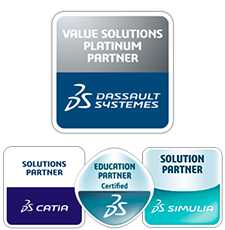 With regard to containers and packaging, the digital twin adds value in the simulation of processes as diverse as injection moulding, encapsulation, filling, movements in the packaging line, and even in the evaluation of secondary packaging. Given the round table’s focus was the technologies we will see in 2021, when one takes into account the current advantages of each offering, the key question for the discussion was, why is their use not more widespread? The three round table participants provided similar answers: technological changes cannot be imposed, the customer must be receptive to those changes and we must adapt to the customer’s pace, understanding their doubts and fears. “There is little doubt that concepts like the digital continuum will end up prevailing, as digitisation breaks boundaries between work roles, allowing real-time access to data and collaboration of all the participants in a project”, as indicated by Francisco Martínez. Thus, the focus is not just on technology, which is only a means to satisfy the needs of the customer. It is also necessary to manage the customer’s expectations, minimising risks and highlighting the advantages of the proposal, including the financial ones.